The demise of patent litigation as a ‘business model’? IT is often said that in the absence of patents on software one can rely on copyright, copyleft, or secrecy. Either way, algorithms don’t merit patents and never should. In fact, patents on software aren't worth pursuing anymore. TAOS v. Renesas, focuses on the interplay between trade secret misappropriation (under Texas law), and patent law. TAOS patented an ambient light sensor using a photodiode array. See U.S. Patent No. 6,596,981. This type of sensor is widely used in smartphones to adjust the display brightness. Following failed merger negotiations, Intersil developed a competing product — which the district court found relied upon confidential information received during the negotiations. A jury found Intersil liable for patent infringement, trade secret misappropriation, breach of contract, and tortious interference with prospective business. Still, the state law trade secret damages were more than 500 times greater than the federal patent law damages. What can we deduce from the above? Well, there are many protections against gross injustices and patents aren’t even needed. When one consents to copyright assignment agreements, for instance, code is then protected from blatant plagiarism or reassignment. The above case isn’t about software, but much can be said about application of the law beyond patent law. “…Texas was already deterring legitimate businesses because of all these lawsuits. TC Heartland made it more so.”Texas no longer receives as many patent filings as it used to receive. TC Heartland has a lot to do with that, as we noted earlier this week and earlier this summer (e.g. "A Post-TC Heartland (and Post-Alice) Patent System is Bad if Not Fatal News to Patent Trolls Like Microsoft’s Intellectual Ventures"). In Recalibrating Patent Venue, Colleen Chien and I did a nationwide study of forum shopping in patent cases (shocker – everybody did it, and not just in Texas), and predicted that many patent cases would shift from the Eastern District to the District of Delaware. And, lo, it has come to pass. Delaware is super busy. But how much did firms value not being sued in Texas? The TC Heartland case is a clear shock event, so an event study can measure this. In Will Delaware Be Different? 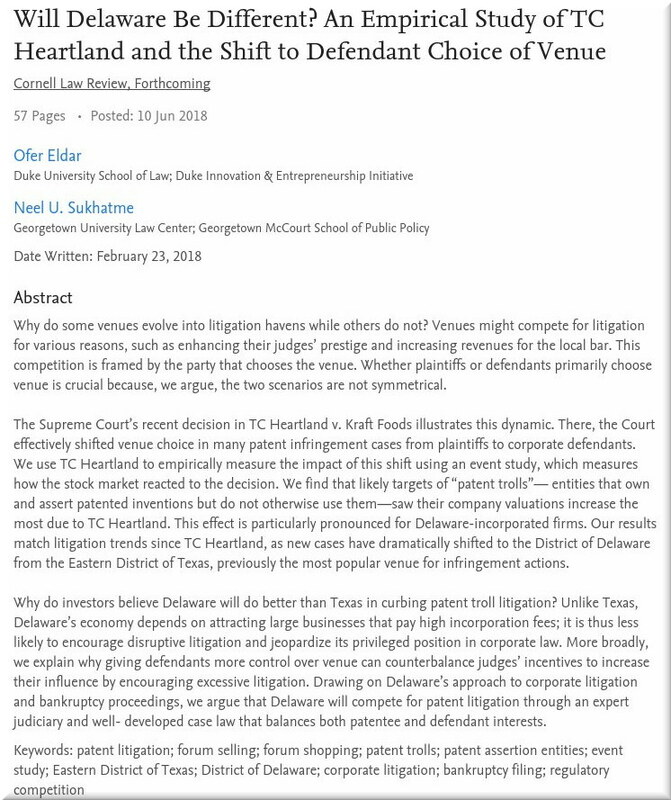 An Empirical Study of TC Heartland and the Shift to Defendant Choice of Venue, Ofer Eldar (Duke Law) and Neel Sukhatme (Georgetown Law) examine this question. As we said before, Texas was already deterring legitimate businesses because of all these lawsuits. TC Heartland made it more so. Can Trade Secrets Litigation Replace (in Part) Patent Litigation?